An exquisite silver Greek Orthodox icon of the St. Anthony. Saint Anthony the Great was born in to a wealthy family in upper Egypt about 254 AD. 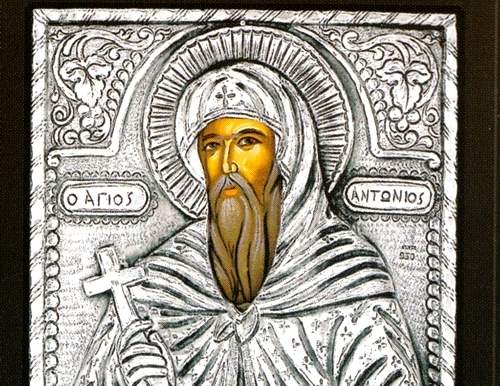 Also known as Anthony of Egypt, Anthony of the Desert, and Anthony the Anchorite, he was a leader among the Desert Fathers, who were Christian monks in the Egyptian desert in the 3rd and 4th centuries AD. The Orthodox Church celebrates his feast on January 17.